Discussion in 'Sprites' started by Clay, Sep 8, 2018. 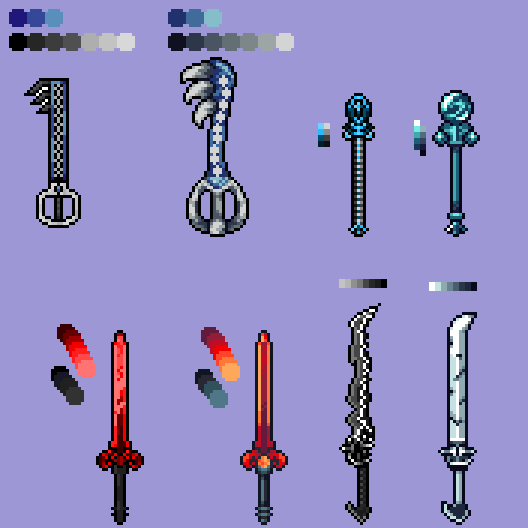 Long ago in a distant past, I made bad sprites of weapons and I thought they were cool. Sonniow's Red Bliss was an edit from some Zelda sprite on a sprite resource site. I just shaded my own way with better colors. Aqua Wand just an ugly mess that needed a revamp. Also to Warren who asked for a keyblade, here a remake bud. NobleJuice and Pochi like this. It'd be cool to join,but the link is down.